Will 255/45ZR18 XL Yokohama ADVAN Sport Blackwall fit on the stock rims? Planning on buying new rims in the futures, just wanted to check. May want to also post this question to Discount Tire Direct or if you'd like I can move it there. generally the rule of thumb is that you can fit a tire that is 4 inches wider than the rim itself. Per Yokohama, the approved rim width range for their Advan Sport in size 255/45-18 is 8" to 9.5" with 8.5" being the most ideal. That said, this size will work on the factory 18x8 wheels. However, this tire is only 27" tall and is not properly load rated for the Tundra. 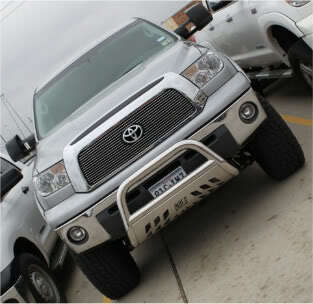 We do not recommend this size or model for the Tundra. would a set of Yokohama Parada Spec-X 275/55R20 be a better match? Not for the factory 18" rim The Parada Spec-X in size 275/55-20 is a great model for the 20" Tundra wheels. I know not the 18", I'm buying new rims, was trying to decide between the 18" and 20". You confused the question b/c original post says you want to use stockers for a bit...so they're answering on that assumption only. Once you change wheels, you have way more options. Yeah, sorry to change my mind, I talked to GUTZ and he helped to change my mind for me. He's a very pursuasive guy. so you are going with 20" rims? If that's the case, I smell a SC coming to your blue beast soon. Are you grabbing his old stockers or something else? No SC for the V6, I just want something with good traction, I don't tow and I don't offroad, so that what he recommended. Oops - didn't read your specs. Yes I agree that some 20s would sit pretty nicely on your ride. Have fun wheel shopping now.